How to restrict technicians from deleting Location Document photos. 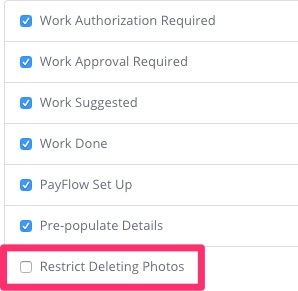 In version 3.6.0 of SWRemote, we introduced the ability to remove the permission that allows technicians to delete photos. Simply log into the admin site (manage.swremote.com) with your administrative credentials. Simply check the box for "Restrict deleting photos" to remove this permission. Technicians will have the ability to view their photo before saving it in the app as well.